Microsoft is working on an HTML5-based Remote Desktop client to allow Windows users to control their devices from the comfort of their favorite browser. The web app was announced at the Ignite event last year and it is now finally available to test. The Remote Desktop client is offered as a preview at this stage, and is accompanied by official documentation on how it can be set up on Windows devices. The web version is compatible with Windows 7 SP1 or Windows Server 2008R2 and newer, but it also requires a "compatible" browser as well. The documentation does not list any compatible browsers, however, so it's unclear which users Microsoft is targeting with it right now. Edge is likely to work on the latest version of Windows and Windows Server, but it's not an option for folks running older versions of the two operating systems. Still, for those who are willing to give it a go, there are some interesting features on offer in the preview stage. 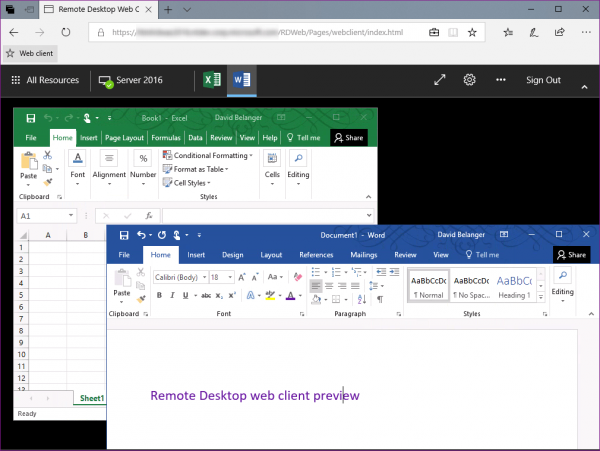 "The first release of the web client can access apps and desktops published from a Remote Desktop Services deployment, copy text to and from the session (using Ctrl+C and Ctrl+V), print to a PDF file, and is available in 18 languages. Additional functionality will be enabled in future releases based on your feedback," notes Microsoft in a blog post. In the official documentation, Microsoft points out that users will get the best performance when running Windows 10 (version 1611 or newer) and Windows Server 2016 (or newer). The client is obviously not meant for prime time, as its preview status indicates, but those who wish to test it can take a look at the how-to guide Microsoft offers (which is available by tapping on the link in this paragraph). It includes all the steps you need to go through to download the necessary files and enable the functionality on a compatible Windows device as well as some troubleshooting advice, in case things don't go according to plan.